In this post, we extend the implementation described in the prior post to include generating an HTML UI and RESTful Api on top of LLBLGen Typed Views and Typed Lists, leveraging the ServiceStack web service and razor framework. The api provides paging, sorting, filtering – source is hosted on GitHub, and a demo is included as well. In this post, we're going to explore building a generic RESTful api on top of a database with custom CRUD and query conventions, using the LLBLGen ORM and code generator, a ServiceStack service layer, and ServiceStack Razor html entity browser layer. This API and html entity browser can be generated on top of any database that LLBLGen supports (see here for supported database drivers). Recently, while building a custom service application in SharePoint, I was exploring various ways of creating a web API, hosted within SharePoint. Obviously, using WCF is the standard in SharePoint, but it certainly is not the only way. 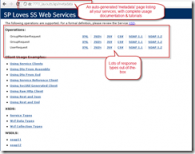 In this post we will create the barebone essentials for building out a web service API, hosted within SharePoint 2010, using ServiceStack.